Valentine’s Day is another one of those holidays. A day when food allergy parents seek to balance the warm, fuzzy memories of our own Valentine parties with the need to keep our children safe and included at theirs. This is one more day in which food sneaks into the classroom, and allergens lurk in a lot of those fun-sized candies. Candies that, to make matters more difficult, are usually separated from their ingredient labels. Chances are, your child’s teacher has already started making plans for Cupid’s day, so it’s best to chat about your concerns now. That’s why it’s time for a #HeartTealHeart talk! If your child has a 504 plan that limits how and when food can be brought into the classroom, or forbids food entirely, now would be the time to remind your child’s teacher of those agreed-upon restrictions. You’ll also have a much warmer reception from most teachers if you offer to help brainstorm or plan a celebration that will be both fun and fits your needs. If food will be allowed at the celebration or in children’s valentines, you’ll want to check in regarding how the day will be handled. Below are some questions you may want to ask. If there are answers that you will find unacceptable, but that you think you’re likely to hear, come up with counter-arguments and suggested alternatives/solutions before having this talk. Remember the Boy Scout motto: be prepared! What sort of celebration is the teacher planning? Will there be a party in the classroom? Will there be food at the party? Who will provide the food? If the teacher plans to solicit food from parents, how does s/he plan to address classroom allergies? Who will check the labels of foods that are brought in? If certain allergens are allowed in party food, how does the teacher plan to include the kid(s) allergic to those allergens? In the above situation, how does the teacher plan to keep the allergic kid(s) safe from contact with their allergens? If an allergenic food is prohibited in the classroom but a parent brings it anyway, how does the teacher plan to handle the situation? Does the teacher have access to safe backup snacks? Are parents invited to come to the party? Does the teacher feel confident that s/he can monitor the allergy situation amidst the chaos of a classroom party? If not, who will provide additional support? Attend the party if you can. Having your own eyes on the situation will probably make you feel the most comfortable–and is a fun experience to share with your child! 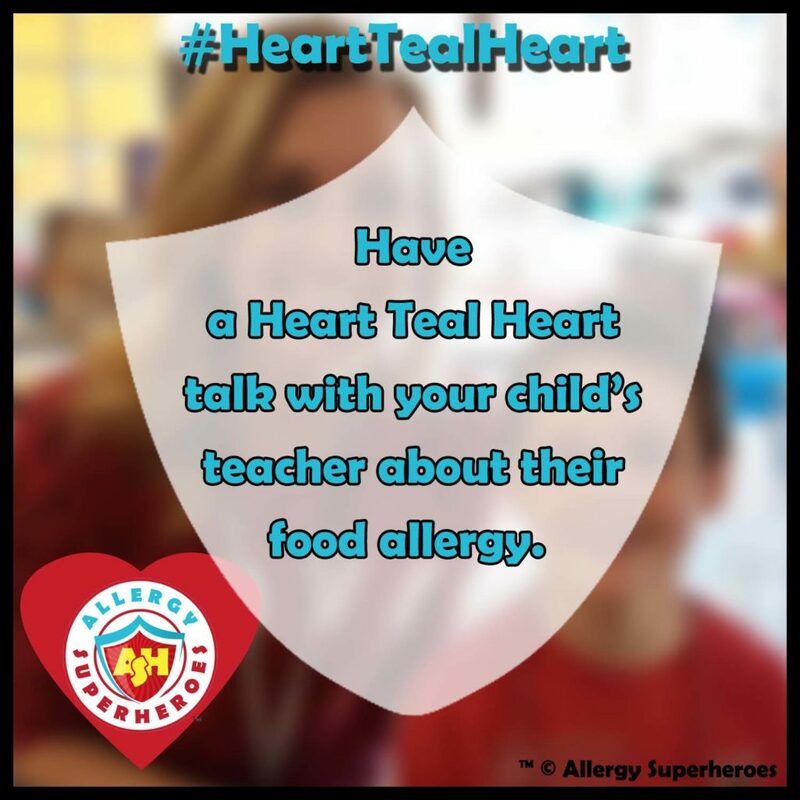 If you can’t attend but you know and trust a classmate’s parent who plans to attend, ask if they’ll keep an eye on the food/allergen situation for you. REMIND YOUR CHILD TO BE SAFE ABOUT FOOD! Go through your regular safety chat, reminding them to read labels (if they are old enough,) to ask adults if food contains their allergens, not to take “I don’t think so” as an answer, and to not eat anything unless they feel 100% sure that a trusted adult checked it and it is safe. Remind the teacher (and your child) of what symptoms to watch out for, and to respond quickly if there’s a reaction. Suggest that foods not be left to chance–having the children decide on what foods they want, with the guidance of the teacher (steering them towards fruits/veggies and away from allergens, for example) and then send out a sign-up sheet or link asking people to volunteer for a specific food. Having this type of plan will reduce allergen exposure, could make the celebration healthier, and will reduce the number of unlabeled, unexpected treats. Volunteer to make and bring something that would be hard for other parents to make allergen-free. Ask to be put on any sign-up sheet before it goes out to the rest. Have the teacher ask parents to make sure they bring ingredient labels and/or recipes in with them, so their allergen content can be verified. Suggest that the teacher have each student bring in their own snack to enjoy, rather than sharing community foods. Suggest Valentine-themed crafts and games that parents could bring in, rather than more sugar. Similarly, you could suggest a book or (small) toy exchange, which can be woven into a game. Suggest food-party alternatives, such as Pajama Day or a fun, themed dress-up day. If necessary, remind everyone that the kids will enjoy a celebration no matter what form it takes, and they don’t need food to have fun. Will the kids hand out valentines brought from home? Are food items allowed in children’s valentines? Will children be allowed to open and eat any valentine candy during class? How will the teacher alert other parents that some candies are unsafe for classmates? Will there be a ban on certain ingredients? How will the teacher handle it if a child comes in with candy that was not allowed? Suggest that the teacher send home an email or note reminding all parents of all classroom allergies prior to any party or valentine exchange. REMIND YOUR CHILD TO BE SAFE ABOUT FOOD! Tell them not to eat any valentine candy in class–to instead wait for your approval of their collection. Send in a safe, Valentine-themed snack for your child on Valentine’s Day, so they have a safe alternative if everyone else is eating their valentines. Ask the teacher to remind parents that there are LOTS of fun, food-free valentines available in the seasonal aisle of just about every grocery store. Suggest that the children distribute their valentines near the end of the day. This minimizes the temptation to snack and also minimizes the chaos in the classroom. Lastly, remember to try to let things roll off your back when you can. Organizing anything with large groups of people can be difficult. Food allergies just add another, very important layer to the mix. It’s not uncommon for there to be bumps in the road, but some are more worthy of our attention than others. If one packet of peanut m&ms ends up in your peanut, dairy, or soy-allergic child’s valentine box, it’s probably best to shake it off–and maybe just ask the teacher to send an extra reminder to the parents of that child the next time there’s a food event. However, if you arrive at a classroom party filled with dangerous foods and sticky-fingered children contaminating every surface in sight, despite the teacher’s reassurance that s/he’d keep it safe, then it’s time to have a serious discussion with those higher up. But don’t jump to the higher-ups over something small. And most importantly, have fun! Remember, Valentine’s Day is all about Love! Next → Next post: Top 40 Food Allergy Blog 2 Years Running! Thank you for sharing all of these tips! It’s true, any time there’s a big event, there are bound to be a few hiccups. You’re welcome! I’m hoping it will help!